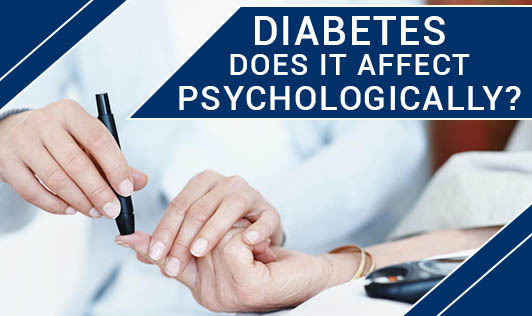 Diabetes - Does It Affect Psychologically? The number of people suffering from diabetes is increasing day by day. Being diagnosed with diabetes not only changes someone's lifestyle, it also brings about a myriad of feelings and emotions that can be difficult to express or deal with. It is important to understand that these feelings are normal and they generally get better as a diabetic becomes more aware of how to deal with the disorder and its effects. Denial: One major psychological effect of diabetes is experiencing denial. At first, a person may get overwhelmed with how the disorder will affect their life. They may also be told that they need to change their diet and eat healthier. A physician may also say that other health complications could arise such as heart disease, stroke, blindness and amputation as a result from diabetes. Depression: Depression is a common psychological effect of diabetes. Depression can be a very serious effect and may require professional counselling and assistance to help deal with this effects of the disorder. Anger: Anger is common in many newly diagnosed diabetics. They may hold resentment against others who freely eat sweets and junk food. They may find it unfair that they are stuck having to make such drastic lifestyle choices when others lead the same lifestyle as them and are perfectly healthy. Embarrassment: This is a common psychological effect of the disorder. The reason for this may be that they have to carry around insulin, blood monitoring equipment or syringes. They may feel uncomfortable taking their blood sugar at a restaurant or at school or office. Acceptance: Acceptance is often the last phase of psychological distress that is associated with diabetes. The diabetic will eventually come to terms with their disorder. They will realize that they have to make healthy lifestyle changes in order to lead a full and productive life. Awareness is crucial. If you are diabetic and face the above mentioned problems, then contact your doctor.